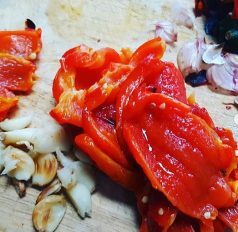 Woodfired Harissa Paste – What to do with some oldish peppers and chillies on a Wednesday afternoon when you’ve had enough office time. 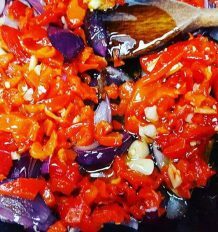 Rustle up some woodfired harissa paste with toasted coriander, fennel and cumin of course! 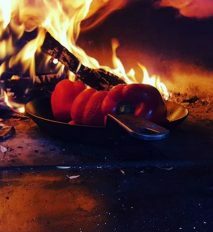 If you don’t have a woodfired oven, you can also do this on a barbeque or even on a regular gas hob although blackening the peppers and chillies on that does make a bit of a mess!! 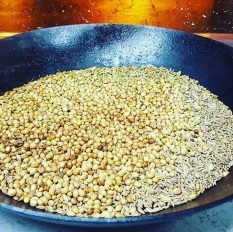 Toast the whole spices in a wide pan and when they are aromatic, grind them to a powder – sieve out any stubborn bits of coriander husk. Always tricky to get rid of it all! 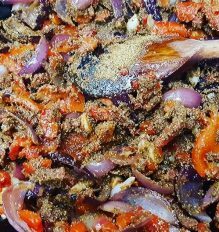 Put the peppers, chillies and garlic cloves in a pan and roast them in the oven until blackened. Put the veggies in a bowl to cool down and cover them with another bowl to create a lid which will make the skins loosen as they cool down. Take the skins off the veggies and the seeds out of the peppers and chillies. 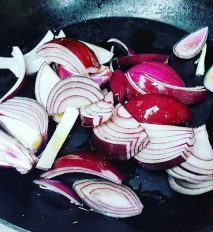 Don’t rub your eyes when you’ve done this…..
Peel and chop the onions and sweat them in a little of the olive oil. 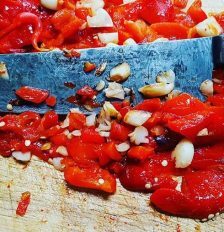 When the onions are cooking, roughly chop the skinned and seeded peppers and chillies and the skinned garlic cloves. When the onions have softened, add the chopped veggies and cook for another 2-3 minutes. Add the ground spices with a good seasoning of salt and pepper. Cook for another 2 minutes. Put everything from the pan into a food processor and whizz it all up until smooth, adding the rest of the olive oil as you do so. Taste for seasoning and adjust as necessary.When it’s cold, keep it in the fridge and use it up within a couple of weeks. The harissa is done! 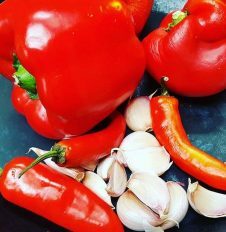 You’ll have the lovely slightly smokey, roasted vegetable flavours along with the toasted, aromatic spices and the heat of the chilli and garlic delicious. 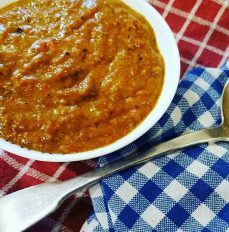 We love this with a flat bread, stirred into yoghurt as a dip or served as a sauce with lamb chops grilled over the embers.